As leader of Nature Designs, Steve Jacobs decided to grow his team slowly, and with purpose. Every staff member is selected based on reputation, integrity and industry knowledge. Some were past students, others were recruited based on their industry reputation, and all have made a personal commitment to continued learning in this ever-evolving field. Why I entered into the landscape business? 1) I have always enjoyed working outside. I was fortunate enough to grow up in a home that included two acres of land. I spent all the daylight hours after school in the yard. My mother had to call me in when it got dark outside. I get a very satisfying feeling growing vegetables, fruits, and ornamentals. I found that I could get an education in this area and earn a living doing it. Why I work with Nature Designs? 2) I am proud of this company because of the amazing team we have. I have learned over the years that the team is far and away the most important asset we have. It has taken many years to build this company and to recruit the professionals that make Nature Designs great. Biggest reward in working with clients? 3) My favorite words from a client are “Wow, I never would of thought of that.” What brings the most joy is seeing a client enjoying their new landscape. 4) This business is about people. Sure, there are plants, soil, irrigation, patios, pools and…. It all comes down to relationships. I enjoy meeting people, solving problems and creating beautiful outdoor environments that my clients appreciate. 5) My favorite clients are the ones that really care about and appreciate their landscape. They want to see it grow and thrive. I appreciate clients who are good communicators. They immediately let me know when they are happy and if they are not. I find this type of client is the easiest to work with. 6) Bachelor’s degree in Ornamental Horticulture as well as a degree in Irrigation and Drainage Design from Cal Poly, Pomona. Associate’s Degree in Automotive Technology from Palomar College. Continuing education with the organizations I am involved with. 8) Ones that our client feels there is no solution to get what they want. I love a challenge. 9) I was born, raised and continue to reside in Escondido. I have traveled to many parts of the world and I enjoy living in Escondido. 10) I enjoy camping, sailing, traveling, gardening and working on home improvement projects with my wife. I am the father of two wonderful young men and I am married to a very special lady. I was first introduced to the landscape industry via a new Water Recycling Technology focused on Irrigation Run-off Recycling. The technology was birthed out of the mind of a 3rd generation landscape contractor in Escondido, CA and I was hired to bring the technology to market. This ultimately led to my deep involvement in the landscape contracting side of the business and eventually I became the Office Manager & Business Development Director for a landscaping business. I was introduced to Nature Designs by a mutual friend of Mr. Steve Jacobs (owner/operator of NDL), and after several interactions including phone conversations and a meeting at the NDL Office in Vista, I was SOLD by the integrity, honesty & ethics of the man himself. Steve creates an atmosphere of trust, respect and a deep commitment to our clients and the work we do for them, while surrounding himself with a team that reflects those same commitments. I can’t think of a better work environment to dive into and thrive within! When you’re in the middle of a large landscape installation, it is easy to stay intently focused on the tasks at hand… but for the home owner and/or client, they are in need of clear & constant communication, to ensure them that the “big picture” has not been lost in the midst of those daily tasks. When this difficult balance is achieved… the results are priceless! My experience in this industry has been primarily from the Office/Marketing/Business perspective… so, to change gears and focus on the actual production process itself has been a rewarding challenge. I had always felt great respect for the “guys in the field”… but I have now gained a new level of respect for the crews, and the sheer quantity and quality of work they complete on a daily basis. My professional experience/training ranges from Manufacturing Engineer to Executive Chef… from Web Design & Marketing Consultant to Sales & Customer Service Manager… and from Business Development Director to Small Business Owner. I’ve been blessed to have what some folks might call a “diverse” professional background. I was born in San Diego, raised in Mississippi, schooled in San Francisco and have made my Home Sweet Home in Vista, CA. I’ve been to every state in the United States, 9 of the 10 provinces of Canada, and most of Mexico in a motor home (except Hawaii, of course!). My wife and I LOVE to travel for food! I enjoy reading and learning about ancient history and mythology, global culinary cultures and traditions, Asiatic languages and biblical studies. I’m very involved in my church and I love inspiring people to be the very best they can be! I’m playing disc golf, reading my bible, listening to funky music, watching Japanese anime, playing with my dog, finding epic restaurants, hanging out with my friends, loving my wife, praising my God and smiling from Ear-2-Ear. 1) I began working for Nature Designs in 1990 on a part-time basis and it turned into a permanent full-time job. 2) I manage the day-to-day administrative operations of the company including transaction accounting, human resources coordination, office communications, and reception, and other functions. I support the operating departments because the employees of Nature Designs are ‘my clients.’ It’s a fast-paced office and I love working with the entire staff. 3) I provide immediate support to our team so any time the phone rings or someone enters my office, my direction changes. I’ve learned to roll with the punches. 4) I earned an Associate Degree in Liberal Arts and a Certificate in Child Development from Palomar College. I also earned a Bachelor of Science degree with an emphasis in Accounting from National University. 5) I was born in Utah but moved to Escondido with my family when I was ten months old. I have lived in the Escondido/San Marcos area ever since. 6) I am the mother of four wonderful children; three daughters and a son. All of my children have now graduated from high school and moved on to college and beyond. My husband and I now enjoy spending more time together traveling, visiting family and enjoying activities that the San Diego area has to offer. I’ve worked in many different industries before but never in landscaping. I continue to learn something new each day from both my co-workers as well as the clients and vendors. I like and get along with all of my co-workers which is nice when having to spend so much time and interact with them on a daily basis. The biggest reward in working with clients is being exposed to new and different types of people on a regular basis. Because we have around 50 employees, most of who work out in the field, the biggest challenge is making sure all paper work is turned into me in a timely fashion so that I can continue to help run the office smoothly and perform my job accurately and efficiently. My duties as Assistant Office Manager are: Payroll, Accounts Receivable, Maintenance billing, Accounts Payable, HR, Administrative Tasks, Supporting each department with their daily needs, to name a few. My training includes over 14 years in finance with an AA in Financial Services and a BS in both Human Services and Management from University of Phoenix. I grew up in Colorado but have lived in Southern California since 1998. I love cats, both making and listening to music, good food, and making new friends. You can find me at a local restaurant sipping a cocktail and enjoying great food with friends, or relaxing in bed with my cat watching Netflix or playing music. Why I entered the landscape business? My first job as a young kid of 12 was mowing lawns and cutting weeds for my neighbors. At first it was a way to make spending money, later it was a way to be outside and to be close to nature. I grew up in the country so I spent a lot of time outside and soon found out I loved growing plants. My first job in the industry was for a small landscape company as an install laborer where I was introduced to irrigation….. This was a fun way to make money and build something creative and so began my passion for irrigation & landscaping. I found out about Nature Designs after meeting Dr. Jacobs, Steve Jacobs’ father. Dr. Jacobs told me that his son owned a landscape company and that I should work for Steve because he was a good man. I later met Steve and volunteered with him at the CLCA landscape technician’s testing grounds at Cuyamaca College. As we started to talk more and connected on a personal level, I found out that Steve and I shared a passion in irrigation and installing high quality landscapes. After meeting the team, I could see it was a good fit, so I joined Nature Designs. Biggest rewards in working with clients? I love meeting people so it is extremely satisfying to delight clients by helping them choose what to do with their beautiful properties. Biggest challenge; what was learned? Sometimes we meet clients who have concepts & expectations regarding their dream landscape and they can’t quite explain it in words. It is our pleasure to bring those dreams and expectations to life through careful listening and planning. I am charged with taking a set of plans and estimating costs to install the architect’s ideas. Once costs have been calculated, I have the privilege of managing the project, helping it run smoothly and within the client’s investment amount. I have been fortunate to have close to 30 years of hands on experience and a formal education at Samuel Merritt College in Oakland where I received a Certificate in Landscape Horticulture. The teachers there were instrumental in sparking a passion in me for the design build field. While in the Bay Area, I also received certifications in Water Management, Irrigation auditing and leadership. I am a father of two and a husband that loves to spend time with my family. I have been, and always will be, involved with my church. I also enjoy eating Mexican food, and love to find great restaurants. I’m fishing, hiking, cycling, antiquing, watching movies, traveling and spending time with my wife & daughter. We love to visit small towns and shop for treasures. This is the first job that I have had in landscaping, but I have always enjoyed working outside and gardening. I love that our focus is working with clients to transform their outdoor living space into something beautiful. I have known Philip Jordan for a few years and when I heard that there was an opportunity to work with him, for a company that he loved, I knew I wanted to be a part of it. What makes Nature Designs a great place to work are the people. I trust the integrity and ethics of the leadership and I value their desire to make sure that the client is pleased with the final results at the completion of a project. The biggest reward for me is being a part of a team that can deliver a client’s dream landscape. There is a level of trust that must be developed because we are working at someone’s home. It is their living space and their retreat. The biggest challenge of being an estimator is knowing all aspects of landscaping. Not just the design of each project and the materials that will be used, but also approximations of the amount of time that each task will take. I enjoy this because I have to see the whole picture of the job and work with the project supervisor to plan out how the job will be done. As a Junior Estimator my role is to take the plan that the designer has created for projects and then create an estimated cost for the build. I am also responsible for finding all the materials needed to complete each project. I am a native of San Diego and have lived here almost all of my life. I have worked in a variety of fields from being a youth pastor to computer networking and being an electro-mechanical technician. I enjoy learning new things and reading all kinds of books. When I’m not working you can find me spending time with my wife, hiking, running trails, playing disc golf, watching movies and exploring new areas of San Diego. I work in the landscape business because I love to work outdoors. I really enjoy seeing how a landscape plan comes alive once the plants are installed. It seems to work like magic. As a teenager I was invited to work on a volunteer project and that’s when I got hooked. I decided that working in landscaping is how I would make my living. I enjoy learning about the latest industry standards and working alongside other professionals who also enjoy this line of work. I’ve been working with Nature Designs for over 22 years. I love the unique challenges that each project presents. I am never bored! The biggest reward is hearing compliments from our clients. Nothing compares to the feeling when clients are amazed by our completed work and hearing how pleased they are with their beautiful landscape. My favorite project was the one in Alpine. It won first place in the CA state competition. The type of projects I love are the ones where we install water features. My duties as a supervisor are vast. Overall, the most important to me are: finishing projects on time, within budget, providing the best quality, with no accidents, and reviewing projects to improve the estimation process. I am landscape industry certified in hardscape, irrigation and softscape. 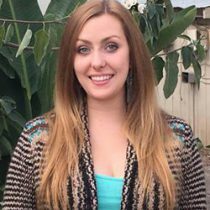 I have earned a degree in irrigation design at Cuyamaca College, and I am currently seeking a degree in water technology. After a long career in the construction industry building infrastructures for master plan communities, I felt it was time to focus more on the details of just one aspect of construction. I have always enjoyed the landscape portion of building communities so a career at Nature Designs seemed like a good fit. I have known the General Manager, Ron Zaccaro, for many years. I really liked how he described Nature Designs and what the company stands for starting with accountability from everyone, including the owner. I felt I could be an asset for the team. I take a lot of pride in the finished product and that requires many moving parts, including the client. I get satisfaction working with our clients by showing them the process along the way. I love it when they really understand the process and flash a really big smile. They are each my favorite when I am in the process of creating a wonderful landscape for the client to enjoy for years to come. I have a Certificate from SDSU in Construction Practices and 35 years in the construction industry. I love going for a ride on my Harley Davidson motorcycle, touring the many wineries of Southern California, and spending time with my girlfriend. I am an artist and an outdoor person. When I discovered Landscape Architecture in college it was a perfect career fit for my Horticulture Degree. The landscape business satisfies both my creativity and my love for nature. I have been in most every part of the landscape industry since graduating and have not wanted to do anything else. When I met Steve Jacobs at a landscape industry Sustainability Conference and he described his projects with such a personal appreciation for his company and the beautiful results, I wanted to design for him. 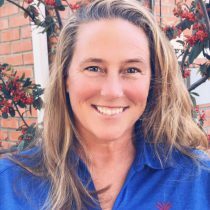 I have been an independent landscape design business owner since 2004 and now I am proud to be a part of the Nature Designs team. Making people happy is what I do. If we can create an outdoor environment that invites people to enjoy their home even more by relaxing, entertaining or just watching the birds and butterflies play, what better reward could there be? I have learned how to listen, to really listen. I have also learned how to be practical and work with a client’s budget. Every single project and every single client become my favorite. I give each project and each client my full attention and focus at every step of the project from beginning of design to end of construction. It does not stop there, however, as each garden is a living, growing entity and I like to visit over the years and watch it mature with my clients. My Horticulture Degree with Honors from the University of Arizona in Tucson had me heading for research and development in food crops from pathology to soils. Once I discovered the joy of arranging plants and patios in landscapes I thought I had gone to heaven! I have been working in the field with contractors, in the office with designers and architects, in the homes of clients and in my own gardens to further that education. Association of Professional Landscape Designers (APLD). I am a certified member and a founding board member of the San Diego District. Currently I am the Treasurer of this district. We provide design consultations at the Spring and Fall Home/Garden Show to the community. San Diego Horticultural Society (SDHS). I am currently sitting on the board as the Secretary. I have either designed, installed, mentored or judged the Fair Display for the SDHS for many years. I have presented design topics at the monthly meetings and volunteered at many local events. MiraCosta Community College. 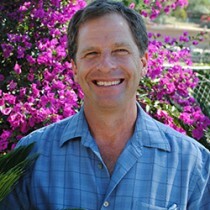 I am an associate faculty member and sit on the Industry Advisory Board for the Horticulture Department. I have been involved in Internship and mentoring programs for the students and volunteer to represent the college at High School Career fairs. Dos Valles Garden Club (DVGC). I am an active member of our local garden club in Valley Center and Pauma Valley. We are a part of local community events as well as offer exciting talks and articles to promote good gardening practices in harmony with our dry climate. I am spending time in my own garden in Valley Center or with my husband and family. 1) I was always interested in design and construction. I would watch any design or construction shows on television, the few there were, and I was rearranging my bedroom several times a year as soon as I was big enough to move furniture. Thinking I wanted to go in a construction direction, my first college major was Building Materials and Wood Technology. This required design classes which introduced me to Landscape Architecture and the amazing outdoor spaces on our campus. I loved that the designs and spaces changed with time and through the seasons and realized I picked the wrong major. I switched the next year to a Landscape Architecture major and haven’t looked back! 2) I really appreciated Nature Designs’ reputation for producing great spaces with quality craftsmanship, and that they support sustainability and education to stay current in the business. I feel confident knowing that my designs will be well-constructed to complete my client’s vision and the original design intent. The company’s support in further expanding my education and career is a great benefit. 3) The biggest reward is showing clients a plan that reflects all of their wants and needs and feeling their excitement about the project. I also love the challenge and diversity of each client and each new space I design. I learn something new on every project. 4) Every client and project has at least one element that makes it/them special. 5) My degree is in Landscape Architecture from the University of Massachusetts, the area where I grew up. 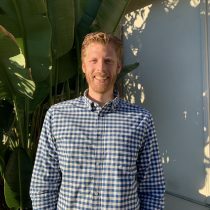 Soon after college I moved to San Diego and I have been working as a landscape designer for Landscape Architecture firms and residential design companies for the past 10 years. I am also a Certified Landscape Irrigation Auditor. 6) Irrigation Association, American Society of Landscape Architects. 8) I love projects that are both sustainable and beautiful. People often think that you need a desert style landscape to use less water, when in fact it can apply to almost any style. 9) I am from Burlington, Massachusetts and went to college in Amherst, Massachusetts. 10) I am enjoying time with my husband and our two daughters. We are often working on projects in our own house and yard! I knew I wanted to integrate into the landscape arena after completing landscape construction and horticulture courses at Mira Costa College. Prior to completing these courses I always helped neighbors and family improve on their outdoor environments. I received a great deal of satisfaction from seeing a project through to completion and into an area that entices people to spend more time outdoors. When I realized that there were careers available in which I could follow these same steps and receive the same gratification, my pursuit to find a reputable company to work for ensued. The landscape world is an interesting place; you have small owner operators, large commercial companies, unlicensed and uninsured businesses, and very few custom outdoor builders. I knew from the beginning that I wanted to work in the custom build space and I wanted to work in a safe place where the company stood behind the work they did. Nature Designs follows all the rules and that makes me feel comfortable knowing we have nothing to hide, we are licensed, bonded, insured, and follow all safety standards set forth by OSHA. I am inherently a rule follower, so when I saw that Nature Designs operated under the same guidelines I was happy to integrate into the system. Communication. I will have clients call me from years past to thank us for the work that we completed. It often times takes 2-3 years for a landscape to grow into itself and these points of communication are always enjoyable. We pride ourselves in being available for our clients. We are responsive and will always call back in a timely fashion. Quality work takes time. It’s easy to sit in an office and say ‘’oh yeah that’s simple you can do that in a couple hours’’, the reality is that good work takes careful thought and consideration. The biggest challenge for me was realizing this fact and allowing the process to evolve in the proper way. I had to adjust my daily goals accordingly. In the end you don’t need to be the quickest, you need to be the best. Understand the clients that I’m working with. We need to know how to communicate with them effectively, learn about what they are looking to accomplish with the space, understand about family size, age of children, type of pets, types of plants, level of water conservation needs, entertainment practices – how many people and how often will they be using the area, when will the yard be used – this will dictate lighting techniques and flow patterns. My job is to explore all these areas and then synthesize them into an aesthetic that fits well with the space and the family. Landscape construction and horticulture college education, business management BA, living bonsai training, and palm and cycad collector. It is my goal to spend as much time outdoors as possible. It can be in the ocean, local mountains, or just working in your yard that keeps me going. It’s a funny story! I always wanted to be just like my older brother. He was in his first year as an engineering student at Cal Poly-SLO at the time it came for me to apply to colleges and select my major. My only real sight was on getting into Cal Poly and my Dad’s intervention may have been some of his most brilliant parenting—both in knowing me and my interests and navigating me through a highly sought after and impacted school. Upon his suggestion, despite my barely knowing what horticulture was, I landed up in San Luis Obispo and bloomed! Over the years I’ve grown to love the landscape industry, not just because of the pretty plants but because I find it to be the most beautiful blend of people, nature and business. I find joy through being in nature, bringing my creativity both in design and in problem solving and helping people. Nature Designs as a company holds similar values to the values I hold personally. Taking care of people. As residential landscape service provider, we are deeply connected to how our work affects our client’s lives. Of course, we work hard, but we have a lot of fun! It’s a culture of collaboration and support. Additionally, Steve (NDL’s owner/operator) is a leader who believes in people and he’s constantly investing in and promoting professional development and education. It’s a beautiful thing! It’s bringing my experience, expertise and leadership style to my client relationships which result in trusted partnerships. It’s common for my clients to feel overwhelmed at the start of a new project or as they bring on a new service provider. Many times, it’s their first large project or they’ve had a less than desirable experience with a previous contractor. I am deeply rewarded as I notice my clients sit back and relax to enjoy the process because that means we have created a trusted partnership and they have assurance that they will be well taken care of. I am masterful at helping my clients define and sometimes even discover the future vision of their project. Many people start our conversation with a list of amenities they would like to have included in their project. I ask my clients to take a step back and we get clear on what they are looking to create in their space. Together we develop a truly inspired vision. Once we have that clarity we let it guide us into the project and help us navigate through the whole process. Once we are clear on what it is that we are really creating together, the rest is easy. Our goal is to provide our clients with exceptional service—both in the installation or renovation of large construction projects and property management. At the most basic level, I connect my clients to the services at NDL. My role is to be the primary relationship for clients as they start with NDL in the construction department. As in any relationship it’s imperative that the communication is effective. I have found success in this business because of my ability to listen to my clients and bring value to the conversation. As a design/build contractor we have the capability to provide 100% turnkey services, starting with design. I am responsible for overseeing the entire design process and the transition into construction. For clients who come to us with a design in place, I am responsible for tailoring our services to meet their needs and budgets. As NDL is a residential landscape management company, I also am responsible for connecting our company to the clients who value our service in the landscape management department. Often times when clients find our company they can’t believe there is a professional, organized and knowledgeable company suited just for their needs as homeowners. We are not your barely tolerable mow, blow and go company that so many have resigned to use for their homes. I can’t wait to meet you at your property and discuss what having a landscape management company will mean for you. Bachelor’s degree in Environmental Horticultural Science with a minor in Spanish from Cal Poly, San Luis Obispo—-go Mustangs! Additionally, I am a graduate of Accomplishment Coach Training Program, a Leadership and Coach training program. I love projects that are both sustainable and beautiful. People often think that you need a desert style landscape to use less water, when in fact sustainability and beauty can be applied to almost any style. I have four AMAZING kids and one hunk of a husband. I am the luckiest mom and wife in the world. My husband and I will be celebrating our 15th wedding anniversary next year. We’ve navigated a lot together as we parent a child with special needs. This experience has shaped me more than any other, causing me to expand my world and faith more than I could ever know. I geek out on leadership and people. Both the experience of parenting my son and working as a woman in the construction industry for so many years has been thoroughly enriching, I’ve also birthed a little side passion. In addition to working in landscape, I have a boutique coaching practice, where I work with female leaders in the construction and manufacturing industry. I love to get crafty and create. We are all over the place on any given weekend. You’ll find me and my crew (my 10, 9 and 6-year-old boys and 1 year old girl) building furniture, renovating our landscape, riding bikes or anything we can think of to be outdoors. Our life very much revolves around family and our church—North Coast Calvary Chapel where we treasure our community. We are very involved with the Mitchell Thorp Foundation, and if you are looking for a wonderful foundation to support—please ask me. My husband and I enjoy getting out for our favorite date, which is to go body surfing and then watch the sunset over a bottle of wine and burritos. Ah—so good! 1) I didn’t plan to be in the Landscape business actually! I was taking a class that Steve Jacobs (the owner) was teaching, and I was impressed by his ethics. I thought to myself “I want to work for that guy” .. now I am, and it amazes me how well suited I am for this, I love it! 2) I was drawn to Nature Designs because of the good business ethics and the commitment to honesty. I won’t work somewhere unless it’s a place that I’m proud to identify with, and the people at NDL truly care about doing things right. NDL represents quality and mindful consideration of the clients’ needs. They are also conscientious of environmentally responsible practices, which is extremely important to me. NDL is a company I’m happy to be a part of! 3) I love helping people to manifest their visions. Everything NDL designs and installs is custom, so we create spaces that facilitate what our clients love to do. I really enjoy that our clients have spaces that represent them. -Where their kids play, where they host parties for their friends and family, or where they can retreat to find peace and solace; whatever will bring them added joy in their home. I also really love being a point of contact for my clients. It’s exciting to share what I know, and to experience the progress with them. Lastly, I love that we can create habitat. Who doesn’t love seeing blooming colors, hearing leaves rustle and birds singing? Not to mention we create habitat for people to spend more time outside in. There are so many rewarding things about working with clients! 4) The biggest challenge for me is when potential clients haven’t made up their minds. Sometimes people know what they want, but have trouble deciding to invest in themselves. It’s also challenging for me when clients don’t communicate, especially if they don’t communicate honestly. We are driven to build dreams, but it’s only possible if clients are ready to make those dreams come true and to clearly communicate what they are. These moments teach me to be a better communicator. They also help me to be intuitive to the needs of my clients, so I can ask helpful questions that facilitate everyone being on the same page. Most of all, it teaches me to practice patience and meeting people where they are at. 5) My number-one duty is to listen. Listening to the clients about what we are helping them manifest and why, listening to the level of financial investment they are going to make, listening to timelines and changes that arise. Lots and lots of listening! I also listen to the fellas that make the construction happen, our ladies in the office, to Steve, to our estimator, to everyone, because we are a team, and the reason we are able to design and build such gorgeous spaces is because we hear each other and work together. In a more direct way, my duties involve meeting with clients, assessing if we are a good fit for each other, getting designs created that will illustrate the clients’ visions, creating proposals and contracts, working with the estimator to match the clients’ investment goals, supporting the construction supervisors to make sure they have what they need to build the design, and being a point of contact with the clients with consistent communication. To summarize, my duties involve being there for the client and the team to do what we say we will do, when we say we will do it. 6) My training is very diverse, there are so many great things to learn and experience! I have 2 bachelors degrees, 1 associates degree, and around 15 certifications. I’m a life-long learner, so I’m sure there will be more. The ones I’ve done the most work with are: Comparative Literature with an emphasis in Teaching, Applied Design with an emphasis in Furniture Design and Woodworking, Teaching English as a Second Language, Sustainable Horticulture, Permaculture, Clinical Herbalism, and Holistic Nutrition. I have spent most of my professional life as a teacher, I taught middle school, high school, and at a college. I thought I would always be in a classroom, whether sitting in a desk or standing up front; but I’ve learned that teaching is really just understanding the needs and potentials of others, then helping to satisfy those needs and manifest those potentials. -This directly translates to me being a great Project Manager. I also grew up with my dad. Together, we planted, harvested, and preserved most of our produce. We rebuilt our home ourselves and we made or fixed most of the things we needed. My dad taught me how to be practical and resourceful, he gave me the opportunity to connect with the outdoors. From this, I am confident aiding clients in choosing plants and understanding the construction process. Lastly, I lived in South America for a year. While there, I learned to speak Spanish, and spent the majority of my time learning sustainable and indigenous methods of agriculture and construction. That time, more than any of my other travels, showed me how many ways there are to do an exceptional job. I think holistically, so I do my best to entertain as many influencing factors in a situation as I can. I believe that beauty can be found everywhere and beauty brings joy. So, when creating, if it’s not beautiful then what’s the point? It’s a huge part of my life purpose to leave this world a better place than I found it. So I’m very motivated by employing sustainable practices and being aware of local ecosystems; I’m also motivated to initiate domino effects that exponentially benefit others. 8) I’m trail running, hiking, rock climbing, camping, reading, watching movies, drinking old fashions, cloud gazing, filling out mad-libs, writing [snail mail] letters to far away friends, recovering from working hard, there’s lots of things I love to do! 1) I come from a long line of avid gardeners. When I was in college, I was offered a position at a local nursery by my future mother-in law. Part-time turned into full time and eventually became a position of substantial responsibility as the manager. I was hooked on day one. It was so exciting to see the ever changing plant material that would thrive in Southern California. 2) Nature designs has a great reputation. I knew many of the people who had worked for them and they all were genuinely happy people. A friend had mentioned they might be looking to expand their personnel. When I spoke to Ron, the general manager, I knew I would click with the people who work there. The employees went out of their way to make me feel like part of the family. 3) I enjoy how every home owner’s vision is vastly different. I love being able to deliver their expectations of a dream garden. I find it very rewarding to educate clients on plant varieties. I absolutely love making people happy. 4) I have learned thru the years that you cannot put a time frame on any garden. I don’t like pressuring clients. It can take several attempts to get the vision just right! I am willing to do what it takes to make their dream a reality. 5) I love all projects. They all have an element that is exciting in one way or another. If I had to choose, I would have to go with a tropical garden. There’s just something about a lush garden that I love! 6) I was born and raised in Southern California. I have worked in the industry for over 18 years. From retail sales at local nurseries, I ventured into commercial landscape only to be drawn back to residential. I graduated from California State San Marcos with a major in Sociology and a minor in Business. I am currently pursuing more education in the horticulture industry. 7) When I’m not at work, I enjoy spending time with my husband and very energetic son. I am an animal lover and currently have 3 cats and 2 macaws. I would have more if my husband would approve. I enjoy being outdoors and working in my own garden. 1) I’ve always had a strong love of nature, and I like to see others appreciate it as well. The right design makes people feel good, and comfortable in their own environment. With the changing seasons, there will always be something new and interesting to showcase in the landscape. 2) It’s a terrific company with a great reputation. I had heard about them for years, and now I’m excited to be a part of the team. 3) I am totally committed to doing what is best for my client. Teaching a homeowner something about the process and watching them get it is a pleasure. I try to make them feel that they have been a part of the process. 4) Every garden is different; every client is different – the combinations are endless. Each new assignment comes with its own set of situations, and I look forward to that. Good communication is essential and it’s up to me to be sure that the client and I are on the same page as much as possible. 5) As an account manager I want to make sure that the client’s expectations are not only met, but exceeded. As leader of my maintenance team, my goal is to teach as well as lead: I want my team members to know what I know, to see what I see, and to be proactive in the field. 6) I attended San Dieguito High School in Encinitas, then went to Chico State University, where I graduated with a degree in Dietetics in 1993. My first job after college was in a large institutional kitchen, but I kept looking out the windows, into the incredibly varied Southern California gardens. That’s where I really wanted to be. When I got my first plant nursery job, I threw away my ladles and grabbed my pruners. I was hooked. 7) My current obsession is pickleball, a fast-moving, fast-growing sport that’s sort of a cross between ping pong and tennis. Before that I could be found playing soccer, which was my passion. On weekends you can find me puttering around my quarter-acre, wildlife sanctuary yard in Escondido. It overflows with birds and butterflies. I enjoy my fruit trees and roses, maintaining the koi pond, and cuddling with my two lap-warmers, Daisy and Lily – named after flowers – of course! 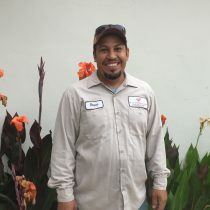 Juan joined Nature Designs in 2012 as our Irrigation Technician. 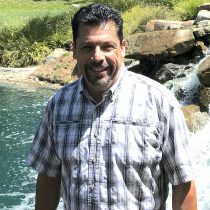 Juan’s experience spans over more than 20 years in the Rancho Santa Fe area as a maintenance provider. 1) I love the Creativity of Design. 2) Nature Designs company size allows me the opportunity to grow. 3) The biggest reward is being able to solve the problem or concern with the client. 4) My biggest challenge is instilling trust into the client that I can correct their issue or concern. 5) My duties are to lead by example and to perform at the highest level. I will always make sure my work meets Nature Designs company standards. 6) I studied in a Horticulture program at Mesa College for two years. 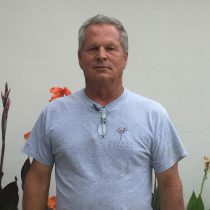 My background is in electrical, plumbing, landscape and all phases of construction with over 35 years of experience. I established my own company in 1987 and served as a contractor for 12 years. I hold a pesticide applicator license which is current. 7) I am married for 24 years and the father of five children. 8) I am an avid hiker logging in 60 miles a month. I also enjoy playing guitar, wood working and cooking. Ever started with Nature Designs in 2004 and is a Maintenance Supervisor who also handles our estate properties. He is a Certified Irrigation Technician. Our client’s love him for his attention to detail. Hugo has been with Nature Designs since 2004. As Maintenance Supervisor, he not only maintains beautiful landscapes, but is focused on reducing their need for excess water and fertilization. Hugo is a Certified Landscape Technician in turf management. 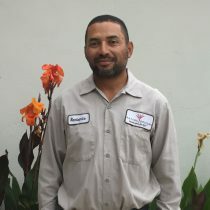 Remberto has worked in the landscape industry for over 10 years. Six of those years with Nature Designs. Originally he worked on the commercial side of landscaping. Remberto finds that the residential landscaping allows him to develop deeper relationships with clients. 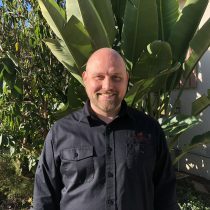 He is experienced with all aspects of landscape maintenance and currently holds a landscape industry certified technician certificate for turf management. Remberto looks forward to adding more certificates. Roque has been in the landscape industry for over 18 years. He originally worked on the commercial side of the landscape industry. He soon realized that relationships were not easy to build when working on the commercial side of landscaping. Roque loves to work one on one with clients to help make their landscape all that they thought it could be. Roque is very knowledgeable on irrigation, plant disease identification and turf management.